Read our breed profile of the Australian Shepherd, a loyal, hard-working and fun-loving dog that makes a great pet for families and individuals. Australian Shepherds are medium to large dogs: Females weigh 40-55 pounds; males are a little heavier at 50-65 pounds. Both genders are between 18 and 23 inches at the shoulders. They are strong dogs, built for long hours of herding through all sorts of terrain. They come in black, blue merle, red merle and red, with or without white markings. Interestingly enough, Australian Shepherds are not from Australia. They descend from working mountain dogs, which were companions to Basque shepherds from southern France and northern Spain. They are quite possibly related to the Bernese Mountain dog of Switzerland and the Pyrenees Mountain dog of southern France and northern Spain, but neither of these genetic links have been verified. Australian Shepherds immigrated to the United States in the 1800s with a wave of Basque herders. Like the people who brought them, the dogs had come from the Pyrenees Mountains. They did not truly become popular until after World War II, when rodeos and other ranch events were in vogue — think Roy Rogers or Hopalong Cassidy. The Australian Shepherd breed standard was developed in the United States, and accepted into the AKC in 1991. These dogs are not listed as native dogs in Australia. Although Australian Shepherds are used for herding, they are considered working dogs in several other aspects; they are not limited to herding activities like some other members of their group. They work as guide and therapy dogs, participate in agility and flyball competitions and also serve as disaster, search and rescue dogs. It should be noted that Stanley Coren, in his book The Intelligence of Dogs, ranked the Australian Shepherd in the “average” category for intelligence. This means that according to his research, understanding of new commands takes 25 to 40 repetitions for Australian Shepherds and they obey the first command 50% of the time or better. To put this in perspective, the top group of dogs for intelligence understand new commands in less than 5 repetitions and obey the first command 95% of the time or more. Additionally, intelligence rankings can be misleading, as a breed may be very good at a task you want completed, so it becomes irrelevant that these dogs do not perform the tasks you don’t want. For example, you don’t use a Chihuahua as a herding dog, so it doesn’t matter if it doesn’t have great herding skills. A therapy dog at a nursing home needs only to be calm and loving; it doesn’t need to be an agility genius as well. Australian Shepherds are thoughtful dogs who have a great ability to work under various conditions with many types of animals. They are “eye” dogs, which means that they herd cattle and other animals with the use of eye contact. Fun fact: Australian Shepherds have also been known to herd children. They are very loyal to their families, and reserved but not unfriendly toward strangers. Lots and lots of vigorous exercise is necessary to keep Australian Shepherds happy. This breed is made for long walks over rugged terrain, so both mental and physical exercise are essential. However, because the Australian Shepherd is such a versatile dog, this exercise can come from agility, herding, a romp in the park or lots of playtime with the children in the family. The Australian Shepherd is a fluffy dog with a very thick coat. He will need regular brushing to keep its coat in good condition, along with all the other standard canine care of teeth brushing, ear cleaning and nail clipping. Australian Shepherds are healthy dogs, but are prone to cataracts, CEA and sensitivity to ivermectin — an ingredient found in heartworm preventive. Talk with your veterinarian about heartworm and your dog. 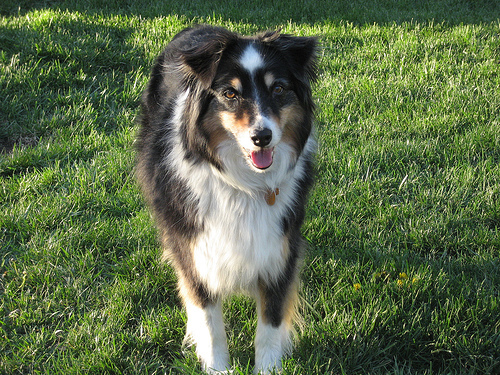 Is the Australian Shepherd the Right Dog for You? Australian Shepherds are great companions for both families and individuals who have time to devote to the dogs both maintenance and exercise. They have a loving personality but may be a little difficult to train; they will need a bit of persistence and reinforcement of expectations. With this breed, you get back what you put in and more. Please consult rescue and adoption resources first. Check out Pets Adviser’s adoptable pet finder. You can filter results by ZIP code and breed.